One of the most prominent, and certainly one of the most recognizable, bands in the 1970s was Kiss. With their onstage makeup, even those who didn’t follow much rock music of the time knew who Kiss was. But who remembers the period when each of the four band members released his own solo album, all at the same time? And who further remembers which of the band members had the biggest hit of the four? Why, Ace Frehley, that’s who. By the late 1970s, Kiss had had some success already. They had hit the top ten with “Beth”, their 1977 album Love Gun had hit #4 on its way to becoming the group’s third straight platinum album, and, amazingly enough, the group had even made appearances in Marvel Comics. 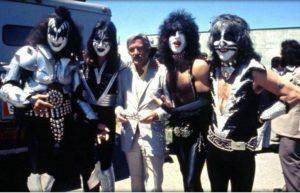 You knew this picture would exist: Kiss with Stan Lee in 1976, courtesy kissonline.com. [d]eciding to do the solo albums was a long process. There were a lot of meetings with Casablanca. But Neil Bogart – in spite of what other people in the industry thought – he was so committed to this band. Neil was going to spend the money. He was told, “This is crazy. You shouldn’t be doing this. This is taking a big risk. It’s a lot of money involved.” But he was just so into it. And beside the fact, he enjoyed working with Bill Aucoin and thought that Bill was one of the great managers in the business, which we all agreed. But it was a real labor of love. And it was a long process. So, on September 18, 1978, Casablanca released four separate albums, some of which sounded quite different from the music Kiss released. album’s music was described as “riff rock, power pop, and just a little bit of soul”. And it seemed to work, at least relatively to his bandmates’ albums; while not the highest charting of the four solo albums, Mr. Frehley’s was the best-selling. 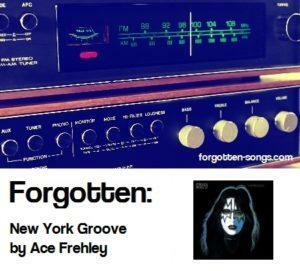 The lead (and, as it turned out, only) single from Mr. Frehley’s album was “New York Groove”, almost, but not exactly, a note-for-note remake of a 1975 UK hit by the British glam rock band Hello. 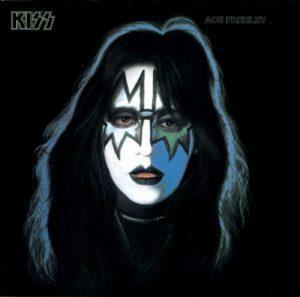 I would say that the production was better, and the sound more polished, on Mr. Frehley’s version. “New York Groove” entered Billboard’s Hot 100 less than a month after the release of Ace Frehley, charting at #87 for the week ending October 13, 1978 (chart). After a relatively slow climb, it peaked at #13 for the week ending February 3, 1979 (chart | magazine). To give you an idea of the differing sounds of the time, its peak was right below a hit by Leif Garrett, and just above one by Barry Manilow. In total, “New York Groove” spent 21 weeks on the Hot 100, which wasn’t bad at all for 1978-79. As it turned out, not only was “New York Groove” the only track from any of the four solo Kiss albums of 1978 to hit the top 40, it was successful enough to end up on Billboard’s Year End Hot 100 for 1979 at #60. So, having recorded their individual albums, what was the next thing that happened to Kiss? Exactly what you wouldn’t expect: an NBC Movie of the Week entitled KISS Meets the Phantom of the Park. ** While the members of the band were disappointed and embarrassed by the final product, KISS Online says it was one of the highest rated TV movies of the entire season. I wouldn’t be a bit surprised. Unfortunately, the four solo Kiss albums were not altogether successful, and while 1979’s Dynasty and its top 20 single “I Was Made For Loving You” had some success, there was also some fan backlash, based on the disco sound on that album. Also not helping was the dissatisfaction among the members of Kiss themselves. Peter Criss left in 1980, and Ace Frehley followed in 1982. Kiss has continued since then, and Mssrs. Criss and Frehley did rejoin the group in 1996, though both have since departed again. When you have a group like Kiss that has been around for so long, it’s normal that some once-popular songs fall by the wayside. Probably, these days, the best you can hope to hear are “Rock and Roll All Nite” and “Beth”. Many other Kiss songs that hit the top 40 are nowhere to be found on radio. As for “New York Groove”…well, I can’t recall ever hearing that, even on the classic rock stations found in pretty much every American city. * Carol Ross-Durborow was head of the Press Office, which was the publicity subsidiary of Aucoin Management, which managed Kiss. ** If you must get this movie, it’s included as a bonus feature on the less expensive (as of this writing) Kissology Volume II 1978-1991. New Kids on the Block is my favourite band of 90s. They had so many hits! The ones I remember are ‘Tonight’, ‘Baby, I Believe In You’ and, of course their hit ‘Step By Step’. These are real songs, not fake like today! And it is awesome NKOTB have a tour in 2019! So I’m going to visit their concert this year. The tour dates is here: New Kids on the Block tour Birmingham. Click on it and maybe we can even visit one of the performances together!